As it is drafted, the Bill actually deprives people, and the State governments, of existing rights on multiple counts. The Food Security Bill finalised by a Group of Ministers should not be accepted by Parliament in its present form. The overriding negative features of the proposed legislation far outweigh its positive initiatives. The framework itself is questionable since the Central government usurps all powers to decide the numbers, criteria and schemes while imposing a substantial level of expenditure on the State governments. Far from meeting the basic requirements for a universalised system of public distribution, it actually deprives people and also State governments of existing rights on several counts — in spite of the opportunity created through huge buffer stocks. First, it cuts down on the number of eligible households. At the Chief Ministers' Conference in February 2010, the government's agenda paper gave the total number of APL (above poverty line) and BPL (below poverty line) households covered by the Targeted Public Distribution System as 18.03 crore. This works out to over 90 per cent of the population, calculated on the basis of the population projections used by the Central government. But the Bill sets a cap of 75 per cent households in rural India and just 50 per cent in urban India. This means that lakhs of families holding APL cards will be excluded from the PDS. Second, the Bill ignores the State government estimations of BPL families. As opposed to 6.52 crore families recognised by the Central government as being poor, State governments, based on their own estimation, have extended BPL coverage to 11.03 crore households, comprising 56 per cent of the population. 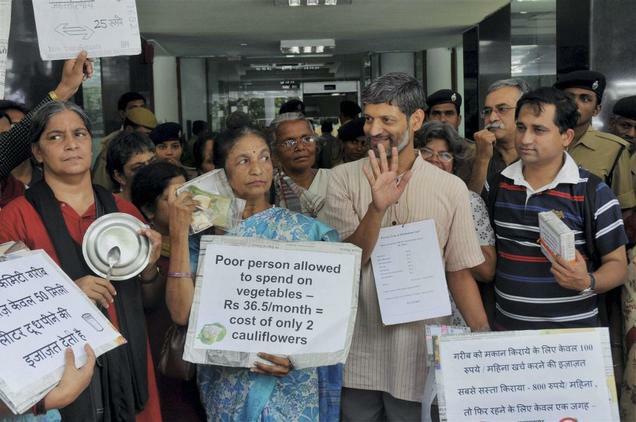 But the Bill puts a cap on BPL households at 46 per cent in the rural areas and just 28 per cent in the urban areas. At the heart of the differences between the Centre and many States on this issue is the utterly inhuman poverty line determined by the Planning Commission, which was Rs. 13 for an adult in rural India and Rs. 18 in urban India. And it was fraudulently linked with poverty "quotas" or "caps." The Bill legalises this anti-poor framework through Section 13(1), which states: "The Central Government shall, for each State determine the number of persons belonging to the priority (BPL) households." In this, the Bill prepared by the National Advisory Council (NAC) provides the government an alibi. Section 21 of the NAC draft states that the identification of priority households will "be based on the criteria notified by the Central Government." It is unfortunate that the NAC members who lead the right-to-food campaign should have accepted such a flawed policy. It surely undermines their own campaign. Third, it cuts down on allocations. The Bill shifts from the present quota of 35 kg per family to an individual-based system fixed at a monthly quota of 7 kg per person for a BPL family. While individual-based quotas may appear to be reasonable, it will end up punishing poor families that have fewer children. For example, in a State like Kerala where the average family size is smaller than elsewhere in the country, the present quota of 35 kg will be cut, say for a BPL family with four members, to 28 kg. It would have been fairer to have kept the minimum allocation at 35 kg for a family and increased it by a certain amount per additional person over an average of five members per family. For APL sections it is even worse, with just a 3-kg quota per individual. Can 3 kg a month provide food security? This is an affront to human dignity and shows an utter lack of social conscience. Also, it needs to be clarified whether a child would have the same entitlement as an adult has. The fourth issue is that of prices. Around 10 State governments have established a system where BPL families get rice at Rs. 2 a kg. In Tamil Nadu, rice is being provided at Re. 1 a kg and to some sections free of cost. The Bill ignores these existing price benefits. In the Bill, the price of rice for BPL families is Rs. 3, not Rs. 2 a kg. However, the price of wheat has been kept at Rs. 2 a kg and that of millets at Rs. 1 a kg. But the Central government has the right to change these prices at any time. For APL cardholders, Schedule 1 of the Bill pegs the price of foodgrains at 50 per cent of the minimum support price (MSP) given to farmers for wheat and rice. Instead of a fixed price as at present, APL prices are bound to move upwards given the farmers' genuine demand to raise the MSP every year to cover higher input costs. Thus the Bill creates a division and a possible conflict between consumers and farmers. While the farmers demand a higher MSP, the APL cardholders' interests will come to lie in lower MSPs. The Bill has a section on reforms that takes forward the government's neo-liberal agenda. Chapter 13, Section 3(g), of the Bill states: "Introducing scheme for cash transfer to the targeted beneficiaries in lieu of their foodgrain entitlements… in areas and manner to be prescribed by the Central Government." This is in tune with the recommendation made by the World Bank in its recent analysis of social protection schemes in India. Thus the cash transfer scheme opposed by a large number of food experts is made mandatory. The State governments are given no choice. It also links the right to food with the questionable Aadhar, or unique identification system based on biometric information. Clause 3 of the same chapter mentions "leveraging aadhaar for unique identification with biometric information of entitled beneficiaries for proper targeting under this Act." The main problem of corruption in the PDS is not impersonation — which is what the UID seeks to address — but diversion and leakages to private traders. The technology is admittedly prone to serious errors. In India, a country with a large number of manual labourers, it has been estimated that the error could go up to 15 to 20 per cent. To make food security rights conditional on biometric proof would be to use another instrument of exclusion. There are some positive features in the Bill including the inclusion of the mid-day meal scheme in its ambit. There are good provisions for nutritional guarantees in the form of a cooked meal for pregnant and lactating women, including for mothers for six months after childbirth. These are universal free-of-cost benefits. There are other schemes proposed for community kitchens for destitute persons, for migrant workers and special provisions for groups or communities identified as victims of starvation. However, disabled persons are once again left out. But where will the funds come from? According to the Bill, the entire payment for all these free schemes proposed by the Central government will have to be made by the State government. Since the largest number of poor people reside in precisely those States where there are very limited resources, expecting the State governments to bear the huge expenditures is unjust and unfair. Already the Right to Education legislation is facing serious hurdles, one of these being the lack of resources at the State level. The Food Bill will become a victim of the same lack of resources syndrome if the present framework for expenses is not drastically changed. The government's desire to get out of public provisioning and the fiscal conservatism underlying the rejection of a universal PDS, and on the contrary the urge to cut entitlements and beneficiaries, are the Bill's key macroeconomic foundations. This was the experience with the Rural Employment Guarantee and the Forest Rights Bills also, but those were quite radically improved because of the intervention of the Left parties. With their parliamentary strength reduced and with the NAC seemingly willing to compromise on fundamental issues, clearly a hard struggle lies ahead to ensure any pro-people amendments in the Bill.